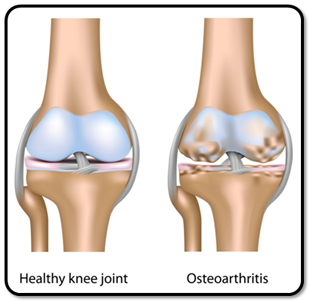 What do you understand by osteoarthritis? Osteoarthritis (OA) is derived from the Greek word “Osteo” that means bones, “artho” means joints and “itis” means inflammations. This is a condition where joints are affected. It is also called as degenerative arthritis or degenerative joint disease. Normally joints are surrounded with a layer of cartilage that help in the smoothly movement of the joint and provides the cushions to the ends of the bones. In osteoarthritis, cartilage becomes thin and breaks down which makes joints to lose its protection and joints can’t move smoothly. OA should not be confused with rheumatoid arthritis or autoimmune disease where joint inflammation is the main feature. OA occurs mostly after the age of 40 to 45. What are the causes for osteoarthritis? In most of cases, causes are unknown; there is no clear evidence why OA takes place. After various investigations it has concluded that overweight, aging joints and injuries to particular joint may increase the risk factor of having osteoarthritis. Person with family history is also more prone to develop OA. Symptoms vary from person to person and depend upon the joint affected. The most common cause is pain and stiffness of the joints. These feelings are worst after resting. Osteoarthritis with said symptoms makes people to lose normal daily activities like walking, climbing stairs, opening a box etc. How osteoarthritis can be diagnosed? X-rays are advised to rule out the OA. Image shows narrowing of the joint with change in the shape. Blood tests are helpful to rule out other types of arthritis. 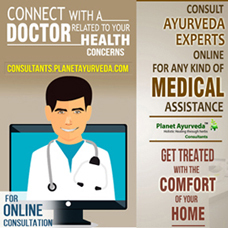 What is the ayurvedic treatment for osteoarthritis? People are turning towards herbal remedies for different types of arthritis including osteoarthritis. 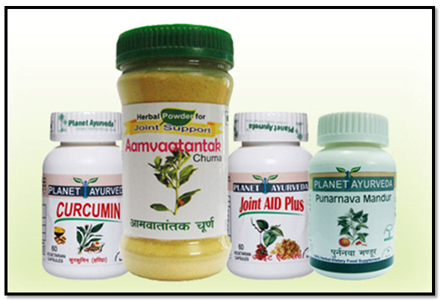 We at planet ayurveda present you all an effective Osteoarthritis Care Package that contains Curcumin Capsules, Joint Aid Capsules, Punarnava Mandur and Aamvatantak Churna. All these natural remedies are made from the specific beneficial herbs or ayurvedic medicines which work wonderfully on joints to take care. Click here to buy Osteoarthritis Care Package for the treatment of Osteoarthritis naturally. Try to cut extra calories and adopt high fiber diet, eat fresh leafy vegetables and fruits. Add vitamin C in your diet, sources are – amla, orange, guava, papaya, grapes, bell pepper, cauliflower, broccoli etc. Use olive oil instead of other fat. Try to lose the weight as this will help to decrease the strain in the joints, back, hips, knees, ankles and feet. Avoid exposure to cold environment. One can use heating pad to decrease the joint pain and swelling. Sleep on a firm mattress. Sleep on your back with pillow under your knees to decrease the backache.